Join us weekly to dig deep into the meat of the Word. In the book of John, Jesus makes the statement I AM 20 times. 7 times, however, Jesus follows up the statement with a metaphor that gives us a glimpse into who Jesus is. Last week we looked at the first of those statements in John 6:35, John 8:12 is the second of those 7 statements. To really understand what Jesus is saying here we need to go back to the beginning of the book of John and see what John has to say about The Light leading up to this statement by Jesus. In chapter 1 verses 4 and 5 John says, "In Him was life, and the life was Light to live by. The Light blazed out of the darkness, the darkness did not understand it and couldn't put it out." In the King James version verse 5 says that the light shined in the darkness, and the darkness couldn't comprehended it. And in verse 9 John says, "There it was, the true genuine light: which enlightens everyone." He didn't mean there enlightens as in I shine a flashlight on your face and it "enlightens" your face. He means it in the way we think of the word enlightenment. He puts it that, The Light is true enlightenment for everyone that the darkness can't stop, delivered in the person of Jesus Christ. Short of one more statement about The Light in chapter 3 verse 19 that I'd like to cover later in the podcast that brings us up to this I Am statement by Jesus in John chapter 8 verse 12. "I am the light of the world. He who follows me will not walk in darkness, but will have the Light of life." With what we learned earlier in John that gives us Jesus saying, "I am enlightenment for the world. He who follows me will not walk in darkness, but will have the true enlightenment of life." Whenever Jesus talks about life it's been my experience that He's talking about spiritual life, not physical life. So what He's offering here is true spiritual enlightenment. This means that as followers of Christ we won't be ignorant of spiritual matters, but will have the understanding of the spiritual truths that bring eternal life. A problem arose though, for those that were following Jesus at the time when He was alive that Jesus points out to them in John chapter 12 verses 35 and 36 when he says, "The Light is among you for only a little while longer. Walk in the Light while you still have it so that darkness doesn't destroy you. If you walk in darkness you don't know where you're going. While you have the Light believe and trust in the Light so that the Light will be within you and you may become children of Light." Jesus later gives the solution to this problem in John chapter 14 verse 26 when he tells the disciples that the Father will send, "the Comforter as my representative - that is, the Holy Spirit - he will teach you everything and will remind you of everything I have told you." If Jesus is the true spiritual enlightenment and the Holy Spirit picks up where He left off and reminds us of His words then that would seem to add more importance to receiving the Holy Spirit. We talked about the Holy Spirit in episode 31 when my son was pretending to be me; Luke chapter 11 verse 13 says, "So if you sinful people know how to give good gifts to your children, how much more will your heavenly Father give the Holy Spirit to those who ask Him." And Acts chapter 1 verse 8 says, "But you will receive power when the Holy Spirit comes upon you. And you will be my witnesses, telling people about me everywhere - in Jerusalem, throughout Judea, in Samaria, and to the ends of the earth." 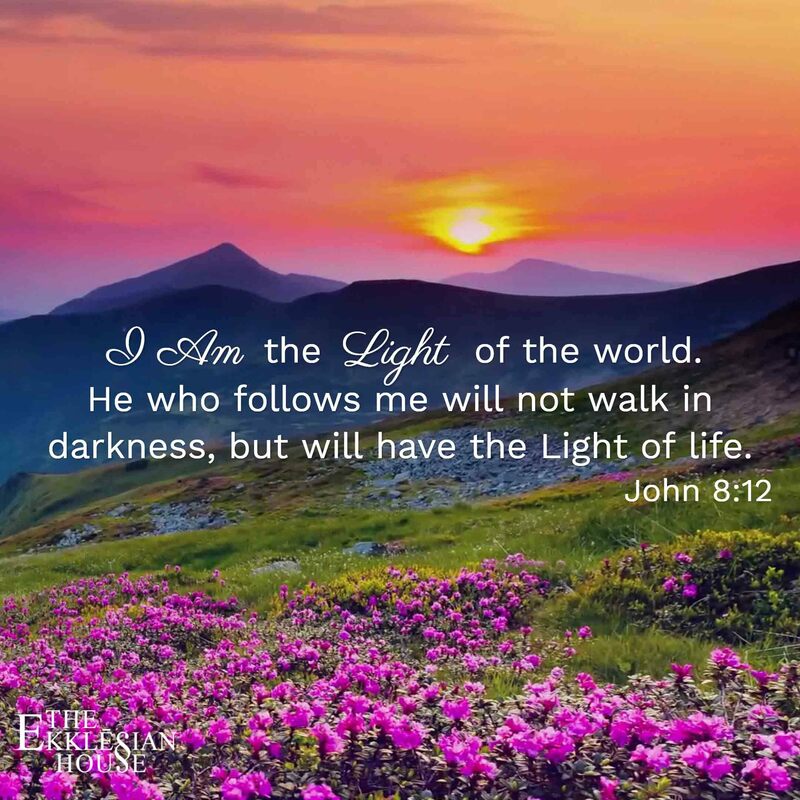 Again in John chapter 12 verse 46 Jesus calls Himself the Light, He says, "I am Light that has come into the world so that all those who anchor their hope in Me and rely on the truth of My message won't have to stay any longer in the darkness." Last week we talked about Jesus teaching the basics of salvation being faith and hope. Here he's saying the same thing and a step further not only is salvation available through faith and hope in Christ, but also true spiritual enlightenment that will forever free you from spiritual ignorance. Is that something you want? Do you want to be set free from being ignorant of the things that are hidden from your physical eyes? It's certainly something I want and am glad that I have in my relationship with Christ. Now I'd like to address John 3:19. Most people in the Western world have heard of John 3:16 and some are familiar with John 3:17. They read, "God loved the world so much that He sent His only son, that whoever believes in Him should not perish, but have everlasting life. God didn't send His son into the world to condemn the world; but that the world might be saved through Him." That is the good news of the gospel and also where most people stop, but it goes on in verses 18 and 19 to say that anyone who believes on Jesus isn't condemned, but everyone who doesn't is already condemned because they've chosen not to believe. And here's the thing that condemns them is that the Light came and you ran away from it because you knew you were guilty." Don't run from the free gift of love, salvation, and enlightenment because you're afraid that your imperfections will be found out by God. God already knows your imperfections, or sins if you'd rather, He knows them better than you do and it doesn't phase Him in the least. We've talked in previous posts a little bit about what I've come through in my life; before I came to Christ I hated God with a fiery passion and would give anything to have been able to spit in His face if I had the opportunity. Not long after I received salvation, in my prayer time I had a conversation with God and he told me that on the day I decided that I hated Him and started running away from Him, He started visiting me in my bedroom at night while I was sleeping to sing over me. Zephaniah 3:17 says, "The Lord your God is in your midst, A Warrior who saves. He will rejoice over you with joy; He will be quiet in His love, He will rejoice over you with singing." You see Gods love isn't just some thing that He once acted on or even waits to be reciprocated. God loves us so much that even in our hate He's focused on healing our pain and declaring our salvation. That's the God that loves us and that's the God we need to be out there showing to others.